Another room down! Whew! We are definitely behind schedule, but due to the basement and our trip out East, it makes sense right now. We still have some finishing touches to put on my office before I can post that as being completed, but that should be next. The next room is the Guest Room, and luckily we have the furniture and most everything for the guest room, we are still trying to decide on colors, but I am looking forward to getting that room done as well. I want to get the guest room done so that when we do the Master Bedroom, we will have somewhere to sleep. The Master Bedroom will definitely take more work, so we will want some time for that. Next week the boy has taken the week off from work, and he and my dad are going to re-do and fix the damage in the basement that we had in February when we were on vacation. We had a quote, but unfortunately it was a lot more than what we wanted to spend (or what we had gotten back from insurance) on the basement. I will definitely be taking before and after pictures there as well. Unfortunately I never got any really good pictures of the basement after we had gotten it set up. We were lucky that we were able to start with kind of a clean slate. White floors, white tiled walls, and a white bathroom. I hated the dark wood, ugly lights, old yucky faucets and silly ugly knobs. The other good part was the shower/tub were in perfect condition. Mirror, gross. So, the boy started by priming the dark wood. My dad had changed the light fixture out a while back and we were able to use it as is for the time being. We had our work cut out for us, but we both had an idea of what we wanted in mind. As we would see things that we thought would work in the room we would pick them up. The first of which was a couple of pictures that gave us the inspiration for the color which is Ocean by Waverly Classics Valspar. It is hard to tell here, but it is a blue green, and I just love it. This is the same type of paint we bought for the laundry room and I just love the way it looks on the wall. The boy said it went on nice and thick too, which I think adds to the appearance. The pictures we wound up returning, because they just didn't look right on the walls. But we did find some that we love. 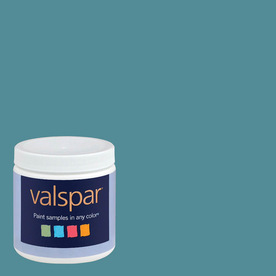 We had gone to Valspars website and ordered paint samples, and with that, we received a $5 off a gallon of paint at Lowes. The cost for a gallon of this paint I believe is $32. We still have a lot left over as well. I love the color, so I am not worried about that. New blind from Lowe's. Mirror $59.99 Home Goods (we had bought a much bigger mirror for here when we did the Master Bath, it was too big, so we returned that and bought this one). Light fixture Lowe's last fall when we bought the ones for the Master Bath and Eat in Kitchen. I need to go back and look at the price on that one. The Tommy Bahama "Relax Map" Shower curtain was from Rue La La back in March for $19.90 and the shower curtain hooks from Target for $9.99. I am still looking for some cute little pineapple ones, but these will do for now. I asked the boy to paint the back of the built in the same color as the wall to break up the white of the shelf. I really like the way that it turned out and the brown/bronze accents. The candles and candle holders were also Home Goods finds, $5.99 for the shorter one, and $7.99 for the taller one. The candles were $3.99 each. You can't really see from the picture, but the brown candle holders actually have a little of the greenish color like the walls on them. When we did the master bathroom we changed out all of the door knobs on the second floor. We went with a lighter brown for towels. These are from Bed, Bath and Beyond. I save up some 20% off coupons. They had a darker brown, but I like the lighter brown better. The pineapple accents are also Tommy Bahama from Rue La La and the whole set, toothbrush holder, drinking cup, soap dish and soap dispenser were $29.90. I saw the same set on eBay for $45.00 so I was pretty pleased with the purchase. The faucet we bought last fall as well when we purchased some other items. The boy installed it, I like the way it turned out. This was the most expensive of the three that we purchased from Overstock.com at $91.99. I wasn't sure about the built in when it was so dark, but I really like the way that it turned out painted. Perfect for storage too. The light on the top shelf, the boy found at Home Goods for $16.99 and I love the way it looks there. I picked the baskets up at Michael's for half price. $1.99 for the small one and $6.99. The Aveda is courtesy of my brother in law who works for Aveda. Candle, Home Goods, and the vintage hair dryer was a Christmas present from my sister, I just love how it goes. Still looking for a couple other things to put in here, but I think we have those around the house. The boy has some neat lighthouses that I think will look great in here. The pictures are also from Home Goods, $12.99 each. They are not the original pictures we had picked out which inspired the color for the walls, but I actually like these better. The other pictures were more wrapped canvas and didn't have the frame, so the colors seemed to blend into the walls where the frames on these pictures make the colors pop more. I still need to have a valance made from this fabric which I purchased for $4.99 on closeout from Hancock Fabrics. I just need to find someone who sews. We also upgraded the knobs a tad. Knobs are expensive. These were $3.79 each, kind of a splurge when you think about it, but I just loved them. We also changed out the toilet lever. This was a $7.99 upgrade and well worth it since the boy changed it out himself. I think these little fixture upgrades make a big difference and really pull things together. He also added some trim around the built-in, really just makes it look finished. Over all I am very pleased with the end result, and I think our guests will enjoy it as well, I wonder who will be first? Jilly!!! It looks so great! I'm in love with the pineapples. You and the boy did a great job!